The Stedelijk Museum Amsterdam is pleased to present Stefan Tcherepnin: The Mad Masters, the first institutional solo exhibition of American artist and musician Stefan Tcherepnin. 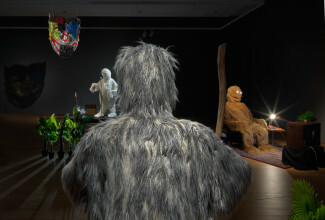 The exhibition is an immersive narrative environment freezing in time moments as experienced by four large monsters. 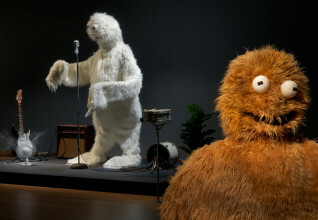 More approachable than they are scary, the furry stuffed creatures are captured in diorama environments, as if on display in an alien natural history museum. Their movement is oriented around a dramatic centerpiece: a glass clown face inspired by George C. Tilyou’s iconic Coney Island Steeplechase Park gate, strung from the ceiling as if a floating holographic amulet. Envisioned as a clairvoyant kaleidoscopic lens, the glass piece contains fragments from potential pasts and futures: hidden in the glass are the eroded borders of US territories in a hypothetical map of a post-climate change United States, superimposed with details of Kazimir Malevich’s Suprematism: Self-Portrait in Two Dimensions (1915), part of the Stedelijk’s collection. 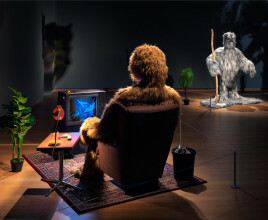 A video projected onto the gallery wall depicts the journeys of the monsters through the four seasons, culminating in the frozen scenes at the Stedelijk Museum. 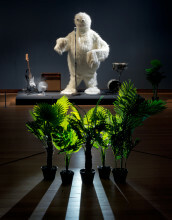 Tcherepnin’s approach to creating visual art is informed by his background in music composition and performance. 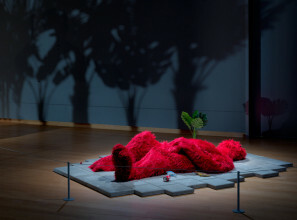 His practice is inherently collaborative, drawing on the artist’s network of artist and musician friends, their collaborative performances oftentimes taking place within Tcherepnin’s installations. Stefan Tcherepnin: The Mad Masters treats individual works as symbiotic elements that unfold temporally in relation to a core idea: like a musical composition, the exhibition functions as a total experience that goes beyond language. The opening of the exhibition will be followed by a concert featuring Tcherepnin’s band Steit as well as frequent collaborator Wally Blanchard, who worked on the music for the video in The Mad Masters. Stefan Tcherepnin: The Mad Masters is curated by Karen Archey, Curator of Contemporary Art, Time-based Media, and builds on a longstanding collaboration between the Stedelijk Museum Amsterdam and the artist. Tcherepnin has frequently appeared as a musician and actor in the museum’s time-based media program, including composing the score, arranging the soundtrack and acting in Ei Arakawa’s How to DISappear in America: The Musical, performed on the occasion of Seth Price: Social Synthetic. Tcherepnin also co-organized and appeared in 2017 the Sonic Acts Festival x Stedelijk Museum: The Mini Sound Series, activating the American composer Maryanne Amacher’s archive. Stefan Tcherepnin: The Mad Masters is made possible in part by the generous support of main benefactor Ammodo.